This comedy-drama unfolds over the course of a winter’s day in Nazareth as a father and son hand deliver wedding invitations for a forthcoming family wedding. This sprightly, accessible comedy-drama by established Palestinian writer-director Annemarie Jacir unfolds over the course of a winter’s day in Nazareth as a father Abu and his son Shadi (played by real-life father and son Mohammad and Saleh Bakri) hand deliver wedding invitations for the forthcoming nuptials of Abu’s daughter Amal (Maria Zreik). Driving around town in a battered old Volvo between visits to relatives and old family friends, Abu and Shadi bicker and reminisce, manipulate and needle each other, gradually revealing the many layers of their relationship. Although now retired, Abu was a schoolteacher who had to find common ground in order to keep his job and get along with his Jewish Israeli employers. As a teenager, Shadi rejected this ‘complicit’ attitude and embraced more radical politics. Today, he lives in Italy, sports a man-bun and metrosexual threads, and has a girlfriend whose father was a big-shot intellectual associated with the PLO. Shadi is proud of that last bit, but conservative Abu quietly despises those he considers terrorists. However, the tension between the two men goes deeper than politics and is profoundly informed by ruptures within the family that are still felt in the present. Jacir’s script neatly unpeels the layers over the course of the movie, and interleaves the simmering tension with moments of terrific comedy. 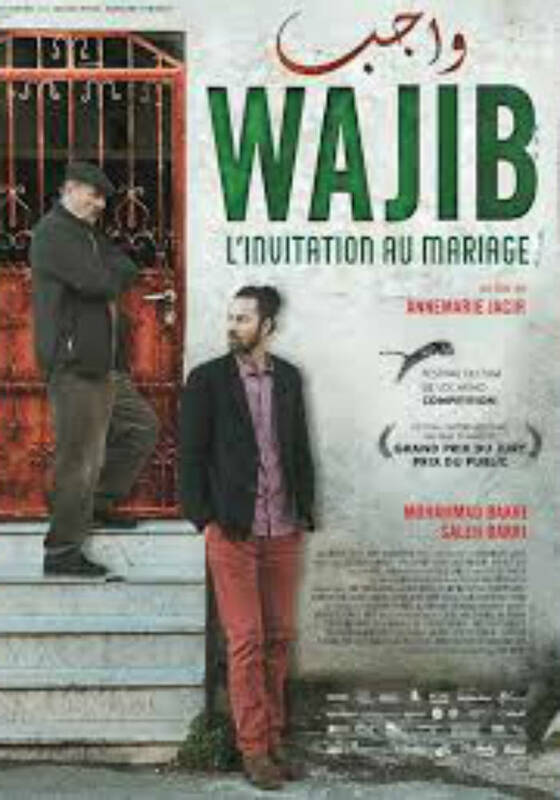 With judicious clarity, the film lays out conflicting views in an Arabic-speaking community, a mix of Muslims and Christians, under immense political and economic pressure certainly, but also just as burdened by the romantic nationalism of exiles – such as Shadi’s girlfriend’s dad – as it is by oppression from the Israeli state. You might argue that the script is perhaps too tidy and neat, but the rich sense of place and the multidimensional characters are too seductive to resist. Source: https://www.theguardian.com/film/2018/sep/13/wajib-review-annemarie-jacir-nazareth-israel, 13/9/2018, edited extracts, accessed 18/3/2019.